Someone was looking at me, a disturing sensation if you're dead. I was with my teacher, Mr Brown. As usual, we were in our classroom, that safe and wooden-walled box - the windows opening onto the grassy field to the west, the fading flag standing in the chalk dusty corner, the television set mounted above the bulletin board like a sleeping eye, and Mr Brown's princely table keeping watch over a regimen of student desks. 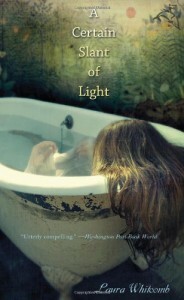 I stumbled upon a copy of A Certain Slant of Light by Laura Whitcomb, a YA ghost story. Not my usual read, but I'm glad I stepepd outside of my usual boundaries to try this. It was a very good book. After benignly haunting people for 130 years, Helen finds out that a boy named Billy Blake can see her. Helen can't remember anything about her past life except for her name and age - she is never seen or heard by the people she haunts, whom she calls her "hosts" She refers to herself as Light, while she calls living human beings the Quick. Helen discovers that Billy Blake's spirit left his body and now he is being possessed by a ghost named James, with whom she falls in love. At first, the fact that she hasn't got a body is an obstacle to Helen and James' relationship, but then Helen finds a girl, Jenny, whose spirit has also left her body. Helen and James can be together, then, and start to discover the mysteries of their past. This is not your usual ghost story, and it is not your usual love story between teenagers, either, partly because Helen and James are adult ghosts in the body of teenagers. Their love story is intense and romantic, depicted in vivid terms, and this is one of the reasosn why the book is more suitable for older teenagers and adults. One of the aspects I really liked about A Certain Slant of Light is the literary quotations. Helen usually haunts people with literary aspirations - she likes literature and poetry. The title itself refers to a line by Emily Dickinson, and the full name of the boy whose body James possesses is William Blake. Moreover, the book contains direct literary quotations, for example from Charlotte Bronte's Jane Eyre. This is one of the features that make this book less of a ghost story and more of a literary piece of fiction. I liked this book very much. Laura Whitcomb has a talent with descriptions - while reading the book you can feel the characters' pain and feelings. I'd recommend this book, not only to lovers of ghost stories or YA books.